Those are the conclusions of a forecast released by the federal government on Wednesday for how the world will use energy and what its carbon dioxide emissions will be over the next 25 years. 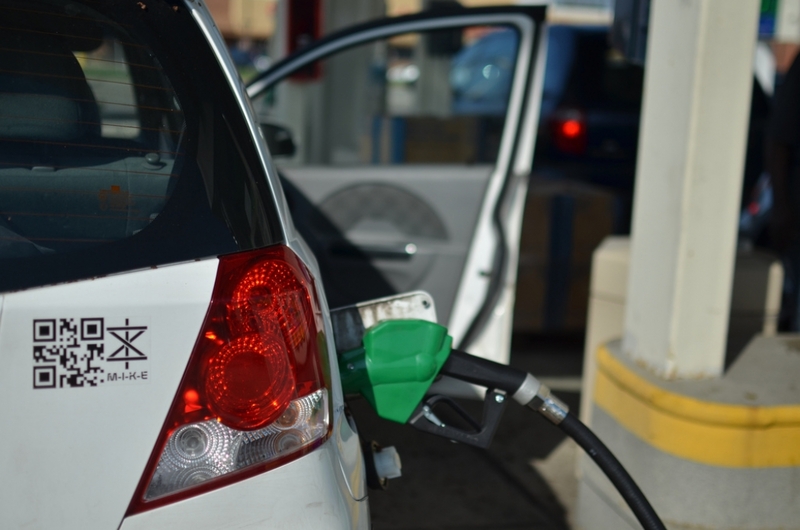 Gasoline and diesel will likely remain the globe's biggest transportation fuels in the coming decades. Global carbon emissions from energy consumption are expected to grow at an average rate of 1 percent per year between 2012 and 2040, growing a total 34 percent in that time as fossil fuels provide the world with more than three quarters of its energy. “With existing policies and regulations, worldwide energy-related carbon dioxide emissions will go from about 32 billion metric tons in 2012 to something like 43 billion metric tons out to the year 2040,” EIA administrator Adam Sieminski said. Developed countries are expected see their carbon emissions increase about 9 percent through 2040, but in the developing world, those emissions will spike 51 percent. That’s because developing countries, particularly China and India, are likely to continue to rely mainly on fossil fuels for their energy. Those countries alone account for 59 percent of the growth in global carbon emissions. Unless there are unexpected changes in global climate policy over the next 25 years, coal will still be the world’s king of carbon emissions in 2040. Coal is expected to account for 38 percent of global carbon dioxide emissions in 2040, down from 43 percent in 2012. Annual growth of coal use by that time is expected to be about 0.6 percent. In 1990, coal was responsible for 39 percent of global carbon emissions. 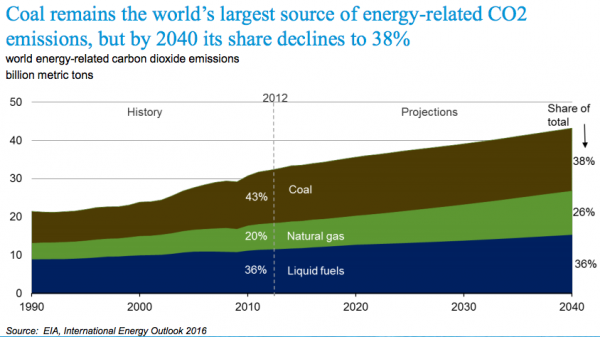 Natural gas, by comparison, will account for 26 percent of global carbon emissions in 2040, up from 20 percent in 2012. China is the world’s leader in coal consumption. With recent announcements that the country will reduce its use of coal by closing down power plants and shuttering mines, the EIA expects the country’s coal use to peak by 2025 thanks to the its economic slowdown and pledge to cut emissions. India is where coal will be used the most in the coming decades as its population, expected to surpass China’s by 2022, explodes and energy demand spikes. Coal produced 72 percent of India’s electricity in 2012, and that’s expected to grow 2.6 percent annually through 2040. 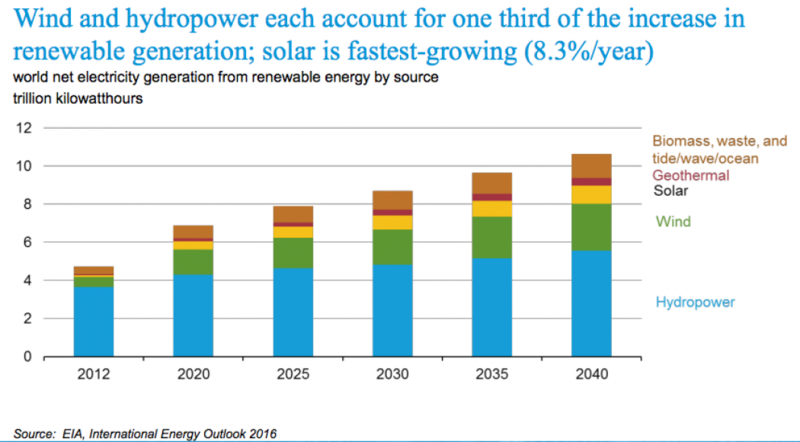 Wind, solar, hydropower and other renewables will be the globe’s fastest-growing electricity source in 2040, growing 2.9 percent annually. That growth means that by 2040, renewables, coal and natural gas will each generate about 30 percent of the world’s electricity, with nuclear power and petroleum accounting for the rest. In other words, electricity generation from renewables will equal that of coal in 25 years. 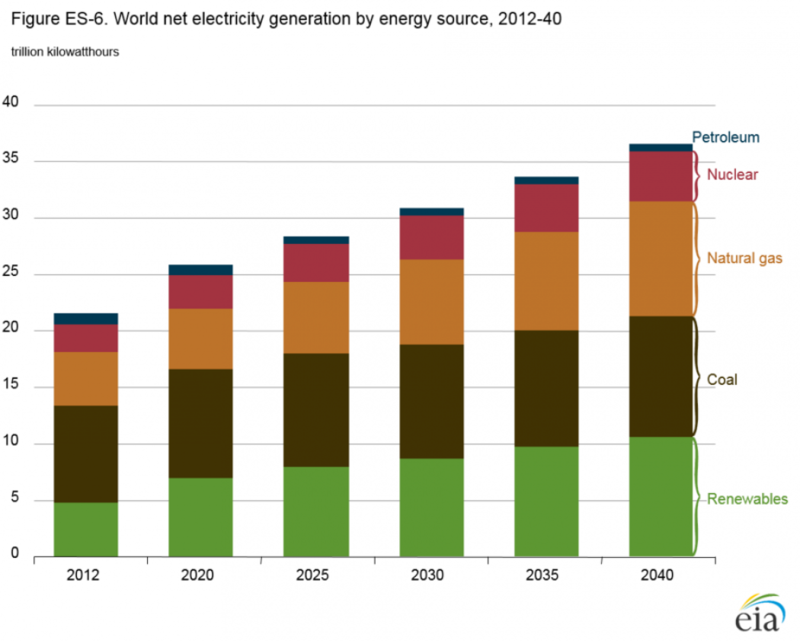 There’s a catch, though: If you ignore hydropower and look mainly at wind, solar and geothermal, those will generate only about 14 percent of the world’s electricity, up from 5 percent in 2012. Solar power will see the most growth among all the renewables, growing by 8.3 percent each year. That doesn’t add up to much power production overall, though. Solar will account for 15 percent of newly-built renewables through 2040, with hydro and wind each accounting for 33 percent. Electric vehicles may seem poised to be the next big thing to take over the highways in the U.S. today, but globally through the next 25 years, they’re likely to be tiny players. 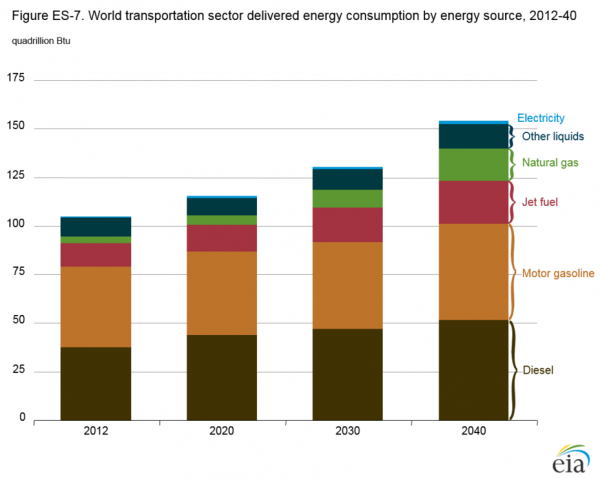 So small that only 1 percent of the global transportation sector is projected to run on electricity. The transportation sector of the future is likely to slurp fossil fuels in 2040. About 80 percent of all global transportation will run on gasoline, diesel and jet fuel, and 11 percent will run on natural gas. “Electricity remains a minor fuel for the world’s transportation energy use, although its importance in passenger rail remains high: In 2040, electricity will account for 40 percent of total passenger rail energy consumption,” the forecast says. Climate policies, such as the Paris Climate Agreement, and advancements in technology are major wild cards when it comes to developing computer models meant to divine how the world will actually use energy in the coming decades and what that will mean for greenhouse gas emissions, Sieminski said. Technology is also likely to change, and it could bring about a revolution in how the world uses energy. Advancements in battery technology could allow for the storage of more electricity more affordably, while declining costs in renewable electricity could bring major changes in transportation. “All of that is extremely difficult to model,” Sieminski said. For example, previous forecasts missed the U.S. shale oil, gas and fracking boom that occurred over the last decade. No one guessed a decade ago that the U.S. would become the world’s chief crude oil producer as advancements in hydraulic fracturing technology flooded the U.S. market with oil and gas. That boom helped to drive down prices and encourage electric power utilities to move toward natural gas and away from coal-fired power plants. Could Baby Steps Be the Best Global Climate Strategy?